Cooper's is a small batch coffee that is roasted and sold locally. Searching for a tasty and rejuvenating coffee that makes you look forward to waking up in the morning? Tried aged whiskey coffee before and been less than impressed? The Bucks not working for you? 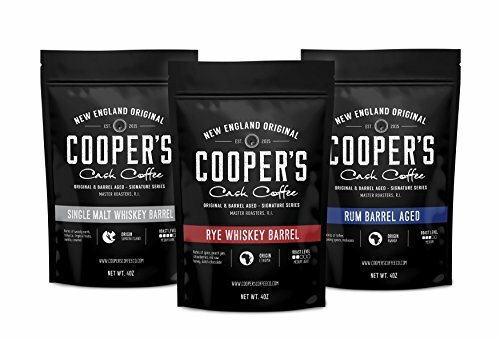 You owe it to yourself to try the earth's finest whiskey & rum flavored coffee from Cooper's. There's only one way to ensure you're getting the highest-quality rum and whiskey aged coffee available; go straight to the master craftsmen for some old fashioned goodness! Once you've tasted the distinct but subtle flavors, you'll know you've finally found the coffee that can bring you all the pleasure you expect from this widely acclaimed indulgence. What Kind of People Choose our Coffee? Serious coffee connoisseurs demand the best. That's why we source the highest quality coffee beans in the world. while working with rum and whiskey companies who share our total commitment coffee. We're pretty picky when it comes to our coffee beans, and we go to great lengths to find premium single-origin coffee beans and classic whiskey and rum to pair them with that meets our exacting standards. If you're not 100% satisfied with Cooper's Cask Coffee, ask for a refund with in 30 days. That's it!